If you have a vendor from whom you buy 2000 vinyl LPs and you wish to sell them without any consignor split at all, you can do that in ConsignCloud by making a "store account". Before beginning to fill out the information, click "Advanced Options". Check the box next to "Store Account". Fill out the information as you normally would. Note that under "Company" is the primary name you will see the account under, not first name and last name. 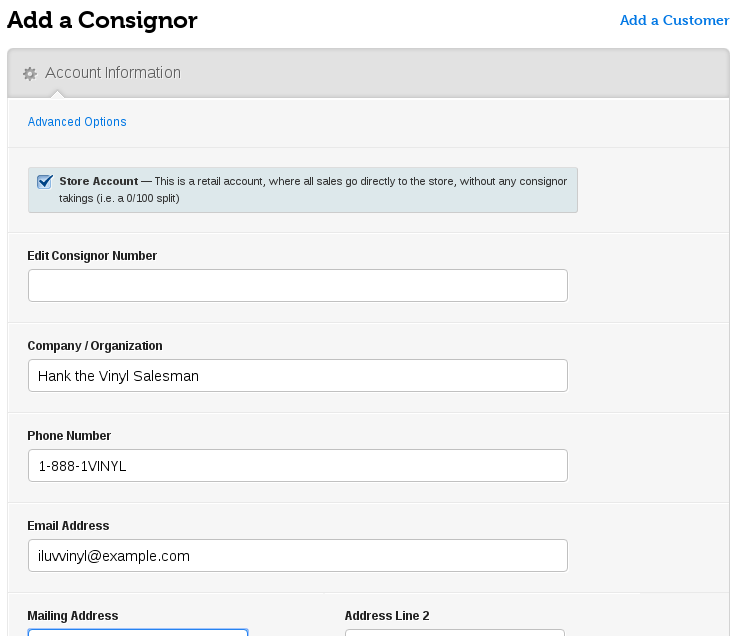 You can make an existing consignor account into a retail account. Navigate to a consignor's page. Click "Edit" under the consignor's name. Check the box for "Store Account". Note that any items that are "received" or "expired" will automatically be changed to have a 0/100 split. Any transacted items ("sold" or "paid) will continue to have the split for which they were sold. You can read about making individual items into retail items here.